January 24, 2013 By Allyson 23 Comments This post may contain affiliate links. Read my disclosure policy. A few weeks ago I posted 14 Fun Ideas for Valentines Day, and I was really inspired to put together some Valentine’s decor for my house. I think Valentines Day is one of those holidays that sometimes falls by the wayside, but these days I will use any excuse to do a cute new craft! 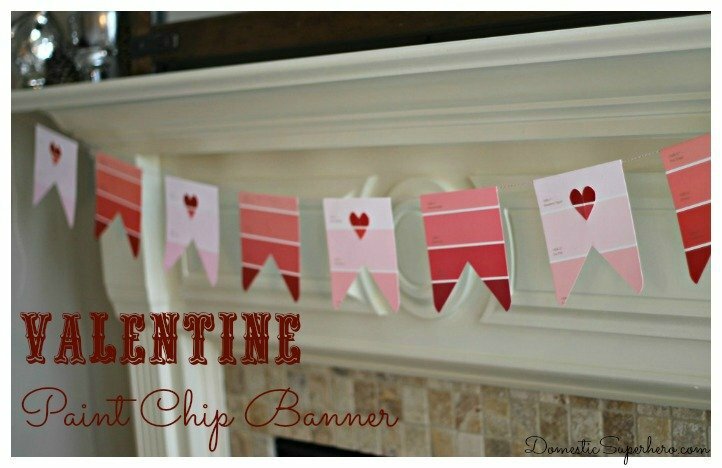 With only 20 days until Valentine’s Day, I loved the idea of making a banner for my fire place, and had a few left over paint chips from when we moved in. I had already done one craft using paint chips (DIY Paint Chip Moving Cards), and I thought using them for this banner would be so cute. This was so quick and easy, and it looks so cute hanging from the mantle. I need to get some additional things for the mantle to tie everything together, but I am happy I started off with this banner. 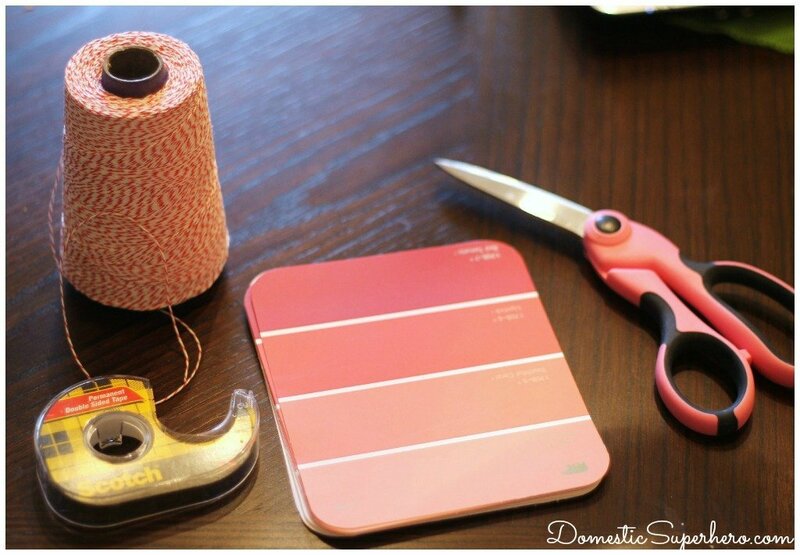 For this project, I used red and white striped baker’s twine, paint chips, double sided tape, and scissors. I ordered a huge spool of baker’s twine over the holidays to use for my gift wrapping theme, and still have tons left over. I recommend this one from amazon. I cut a V in the bottom of the card, and then used that first one as a template to trace the V on the rest. I wanted the V to be mostly the same size and shape on all the cards (and since I can never cut the same straight line twice…), so I stuck with the tracing and then cutting it out. Next I folded the top part of the card down, and ran the string under the fold. I stuck a long piece of double sided tape on the fold to secure the flap. I repeated this until I had 9 cards on the twine (this might differ depending on how big your mantle is, and how far down you want the hang). Make sure to leave a little extra twine on the ends so you can secure it. With the scraps from cutting out the V’s, I cut out little hearts to glue on the contrasting colored paint chips. I put one clear push pin on each side of the mantle, and then tied the string around it to secure. Finished! What are you working on for Valentine’s Day? Oh! good idea! 🙂 I really like it ! 🙂 (I’m loving the spool of baker’s twine, it’s so nice) by the way it’s Ingrid from nowathomemom, for some weird reason can’t seem to use my wordpress account to leave comment anymore? so weird. So weird! Sometimes it does that to me too, since I am on self hosting now….annoying! teacher too). Thanks for the idea! red marker or did you use a rubber stamp & ink pad(they look so perfect)? 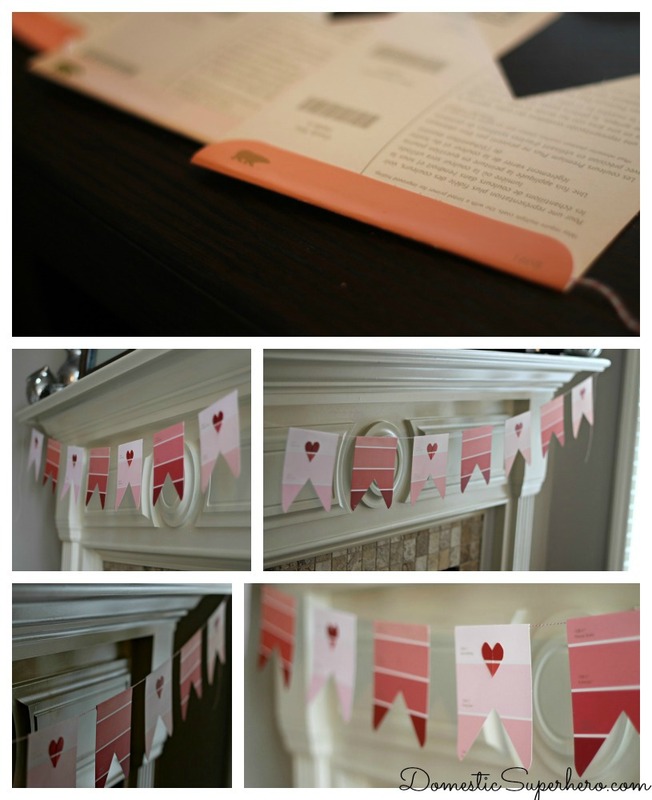 I mentioned it in the 2nd to last sentence above, “With the scraps from cutting out the V’s, I cut out little hearts to glue on the contrasting colored paint chips.” It was pretty simple and you could use double sided tape to secure them if you don’t want to glue them! reading glasses a couple of weeks ago and will be getting new ones soon(thank goodness). This is a fantastic idea and sounds pretty easy to do! I might be making a trip to the paint store this weekend. Thanks for the great idea! Now this is brilliant! I love your paint chip banner!!! So cute! This is so cute! I love using paint chips for projects! Thanks so much for sharing with Share Your cup. Starting Feb. 1st I will be posting ‘Showing a little Love’ each day through the 14th. Each day I will hi-lite a couple of Valentine posts. I will surely share this. I will let you know when. Thank you Jann! Let me know when you post it! Happy Valentines! Thanks Jessi! I love your linky parties! Featuring you tomorrow from Pinworthy Projects! yay! Thanks for letting me know! Can’t wait! Well try something at least!! Thanks for the sweet compliment and stopping by! Hi, just hopping by to say that I am featuring your banner on my ‘Showing a Little Love’ challenge post today.